Ow, Y.X., Collier, C.J. and Uthicke, S. 2015. 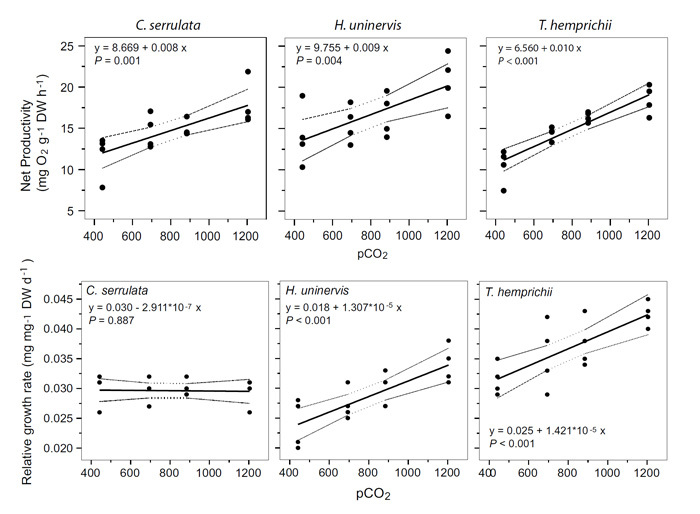 Responses of three tropical seagrass species to CO2 enrichment. Marine Biology 162: 1005-1017. Introducing their publication in Marine Biology, Ow et al. (2015) note that increased atmospheric carbon dioxide leads to ocean acidification (OA) and CO2 enrichment of seawater, which leads them to further remark that "given the important ecological functions of seagrass meadows, understanding their responses to CO2 will be critical for the management of coastal ecosystems." Following the implications of their own assessment of this still-evolving situation, the three Australian researchers describe how they examined the physiological responses of three tropical seagrasses (Cymodocea serrulata, Halodule uninervis and Thalassia hemprichii) to a range of seawater pCO2 levels in a laboratory study, where plants of the three species "were exposed to four different pCO2 treatments (442-1204 µatm) for two weeks, approximating the range of end-of-century emission scenarios." And what did they thereby learn? Ow et al. say the results of their study "demonstrated that tropical seagrasses can increase their photosynthetic rates, adjust photosynthetic performance and increase growth rates in response to CO2 enrichment" (see figure below), and that this "ability of marine macro-autotrophs to utilize the greater CO2 availability suggests that they will thrive under future scenarios of climate change," further citing Koch et al. (2013) in this regard and adding that still-earlier "observations of high seagrass abundance at CO2 seep sites indicate seagrass productivity might continually benefit from pCO2 enrichment over the long term," citing Fabricius et al. (2011). Figure 1. Linear model fits (dotted lines indicate 95 % confidence intervals) for net productivity and relative growth rates of C. serrulata, H. uninervis and T. hemprichii in response to pCO2 enrichment. Fabricius, K.E., Langdon, C., Uthicke, S., Humphrey, C., Noonan, S., De'ath, G., Okazaki, R., Muehllehner, N., Glas, M.S. and Lough, J.M. 2011. Losers and winners in coral reefs acclimatized to elevated carbon dioxide concentrations. Nature Climate Change 1: 165-169. Koch, M, Bowes, G., Ross, C. and Zhang, X.-H. 2013. Climate change and ocean acidification effects on seagrasses and marine macroalgae. Global Change Biology 19: 103-132.